The T&S Brass B-3972 waste drain valve is made for a 31⁄2-inch sink opening and has a rough chrome-plated body. The handle on the lever has a plastic, heat-resistant grip to reduce the risks of injuries. 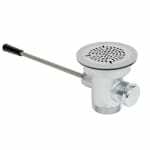 The drain valve has a snap-in, removable strainer that measures 31⁄2 inches and an overflow outlet with a cap and a sealing washer. The valve has a 2-inch NPT male thread with a 11⁄2-inch NPT female thread. The diameter of the strainer is 47⁄16 inches. The height of the drain valve is 41⁄2 inches. The length, measured from the end of the handle to the middle of the adapter, is 121⁄8 inches. The T&S Brass B-3972 waste drain valve is ASME and CSA listed.